Jack Oliver Evans (1915-2001) began a professional career in music and education in 1937 that lasted for sixty-four years. He was regarded as one of the finest teachers and band directors in the country at the pinnacle of his career. Evans grew up in the Cleveland Schools and became fascinated with the sound and sight of a trombone. He had positive experiences through his school career, claiming that he “never had a bad teacher.” Evans truly began teaching while still a junior high school student, and at that time decided that education would be his life’s devotion. Evans attended John Adams High School and played first trombone in the Orchestra that won the National Orchestra Competition in 1932. In 1937, he received his Bachelor of Arts degree in Music Education from Western Reserve University, where he was drum major of the band. Jack Evans began his professional teaching career at Shaker Heights High School in 1937, as he was in charge of instrumental music. He spent thirty months (1943-1946) in the United States Army as a band leader and variety show leader traveling through various parts of England and France. The year 1947 proved to be a pivotal time in his career as he was hired as an Assistant Professor in the School of Music at The Ohio State University. He was assigned to teach low brass instruments to music majors and also was made Assistant Director of the Ohio State University Marching Band, in addition to beginning a second concert band called the “Activities Band.” In 1952, he rose to the rank of Marching Band Director, a position that he held for twelve years. During his tenure as director, he took the band to the Rose Bowl, made the first sound recordings and motion pictures of the band, and moved the band into a new practice facility in Ohio Stadium, while developing a comprehensive tradition of excellence. He retired in 1964 as the Marching Band director, but remained on the School of Music faculty as the head of Brass Instrument Instruction until fully retiring in 1973. After his retirement, he returned to Ohio State and the School of Music as a career counselor for music education students and also acted as a new student recruiting coordinator until 1985. 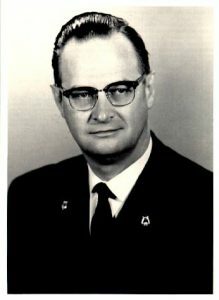 Evans also became the first acting director of the “Active Band” of the TBDBITL Alumni Club in 1968. He conducted the All-Ohio Boys Band from 1967-1969. Jack Evans remained active after retirement in music throughout Ohio and the nation. He was a guest conductor and clinician to many bands and for many adjudicated events around the country. Jack O. Evans died on the 14th of November, 2001. Evans is survived by his wife, Carol J. Evans, and thousands of grateful students whose lives he touched.